A monk was out walking one day and saw something shiny on the ground. He bent down to pick it up and found that it was a very valuable, precious gem. So he cleaned it off, put it into his bag, and continued on his way. A little further along, he met up with a man who asked him if he could spare something to eat. The monk said “Sure” and he opened his bag to get something out. When he did, the man looked inside and saw the gem. He asked the monk, “Could I have that?” and the monk said “Certainly.” The man took the gem and went on his way. The Christian life begins in grace and grows in grace and reaches its final rest in grace. This life, when we have eyes to see and ears to hear, is pure grace. It is God’s gift to each of us, and we do not know how long it will be. 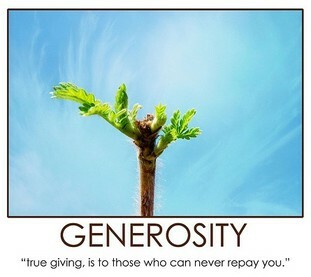 The apostle Paul speaks of grace as God’s generosity to us and our generosity with one another. The basis for all of this is our relationship with Christ. Paul states it beautifully when he writes, “For you know the generous act of our Lord Jesus Christ, that though he was rich, yet for your sakes he became poor, so that by his poverty you might become rich” (2 Cor. 8:9). This is a powerful Christian affirmation. As we hear the words of Paul we become aware again of what has drawn us to this Christian journey – that Christ has done something for us, indeed he’s done something in us, and we can’t see the world the same anymore. We can’t turn a blind eye to the suffering in other parts of the world. We can’t pretend that people near to us are without need. We can’t live only for ourselves, because that would deny who we are becoming through Christ. You and I are called to live generous, grace-filled lives. A generous life is a life that recognizes the poverty in riches, and the riches to be discovered in giving ourselves away. God’s grace, when we truly receive it, inspires us to be gracious to others. How can there be a limit to our lives when we have been given everything? How can we fail to see the amazing grace that is poured into our lives, bringing us forgiveness, purpose, and peace? How can we not respond with an eagerness to reflect the presence of Christ here and now? “For if the eagerness is there,” Paul writes, “the gift is acceptable according to what one has — not according to what one does not have” (2 Cor. 8:12). That is all God asks of you and me – not to give until it hurts, but to give until we find our joy overflowing, to give until we experience what grace is all about, to give by sharing Christ’s abundance in a world that tends to see only what is lacking. This is a beautiful post. I love this perspective on giving with joy. Wonderful. Thanks. Joy is the best clue of giving from the heart! Without it, duty is the likely motive. God bless you sir. Powerful, Spirit filled insight is yours; Grace and generosity perfectly put into words undeniably written through divine inspiration. Beautiful post. Thank you for reminding us that grace is a power, a weapon of sorts. Thank you for posting. Oh Mark, you have done it again! Your words have inspired me to repost this blog entry on my FB page so others can find your words and the words of Paul and the story of the monk – and be as inspired by them as I am. Thank you, dear friend. You are a unique, one-of-a-kind gem! !